Lobtuf asked the Answer Line forum what to do when he wants to remove a USB drive, Windows insists that a program is using the drive, but you can't find such a program. Windows really should tell you what program is using the drive, but it doesn't. You're going to have to do some detective work. to make sure that a program that used the drive (or was launched from it) isn't still running in the background. 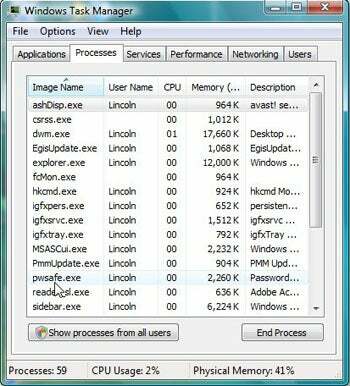 If those tests don't bear fruit, check your running processes: Right-click a blank spot on the taskbar and select Start Task Manager. Click the Processes tab. Examine the list of running processes. If you find a likely culprit, select it, then click the End Process button and confirm your choice. That didn't work, either? Well, you've waited long enough. Let's see if Windows will declare the drive safe to remove. The obvious choice is to shut down Windows (and no, hibernating it won't do), remove the drive, then reboot. This is completely safe, and it will work. But it's time-consuming, and requires you to reload all of your programs and files. The second choice is the foolhardy one: Take a deep breath, then remove the drive despite the warning. I confess: I've done this on numerous occasions, and it has never led to disaster. But I've heard people say that about driving while texting, so you probably shouldn't follow my example. The third and best option is to use third-party software that can identify, and even kill, whatever process is still holding on to something on that drive. Here are two possibilities. it replaces Windows' Safely Remove icon with its own. 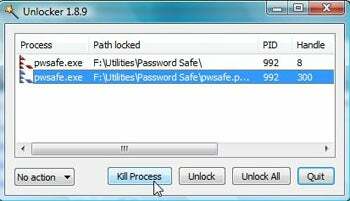 Click it, and if it can't safely remove the device, it will bring up a dialog box giving you the problem processes. A handy Stop Again button lets you retry the removal. The problem: USB Safely Remove costs $20. Unlocker, on the other hand, is free. And it also helps you delete files that Windows won't let go of. If Windows says the drive can't be safely removed, right-click it and select Unlocker for a list the problem processes.